Q: How often should you pump a residential tank? A: Every 2-5 years depending on the number of people in a household, amount laundry washed, age of the system and thickness of sludge. Newer systems generally have filters connected to them, which require more frequent pumping of the system. The filters aide in the preservation of your drainage lines. Q: How do I know if a septic tank company is certified? A: Visit this website: https://dph.georgia.gov/sites/dph.georgia.gov/files/EnvHealth/Sewage/Contractors/EnvHealthInstallers2018-02-14.pdf for a complete listing of certified companies in Georgia. Q: Where is my septic system located? A: Contact your Environmental Health Department to receive a copy of the diagram of inspection done at the time of installation of the system. If your local Environmental Health Department does not a have a record of the installation, we can help you locate the tank. Q: What is the white pipe sticking up in my yard? A: This is access port for clearing a blockage from your system. You CANNOT have your system pumped from this pipe. This is where a snake(device used to unclog drains) is placed if the systems has a blockage. Q: Is there anything I can do to keep septic tank from backing-up in my house when my system fails? A: If your system fails and backs-up we can install a device called a “Sewer Popper”. This will allow the contents of the septic system to back-up in the yard rather than in your home. Q: How do I know if I have a problem? A: Of course, the most obvious is the back-up of sewerage in your tub, toilet or sink. However, here are a couple more signs; a presence of raw sewerage in your yard or toilets losing vacuum when flushing. 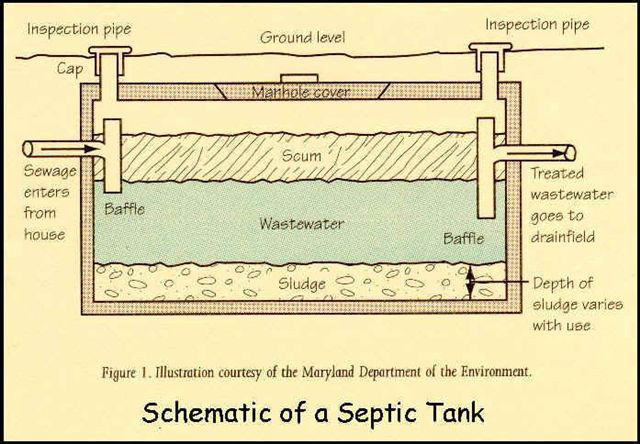 Q: What is a septic filter and how is it cleaned? 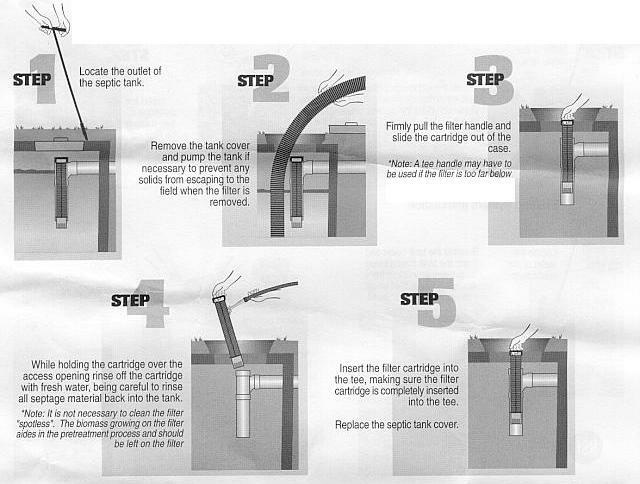 A: The diagram below shows the step by step process involved in cleaning the filter on your septic system. The filter shown in the diargram is a typical design of filters used in systems today. Filters were place on most septic systems installed after 1994. Q: How does my septic system work? 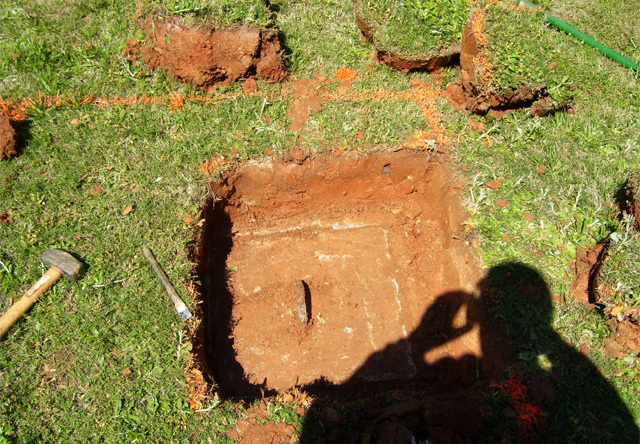 A: The example below gives an inside view of the septic system you have located in your yard. Q: How do you access the septic tank? A: A hole must be dug in the yard. The size of the hole is determined by the age of the tank. The older tanks have larger lids than the new ones. The picture below is a newer tank. Q: What should I not flush down a toilet on a septic system? A: Cigarette butts, Sanitary napkins, tampons, dental floss, disposable diapers or wipes, cat liter, condoms, paper towels, bandages, grease or oils, medical gloves and paper towels are the items found the most in problem systems. Also do not use large amount of bleach . Q: Why does everyone tell me not to wash clothes all in day? A: Doing an excess amount of washing during day puts a large amount of water in the system at one and put stress on the system. Staggering your washing of clothes so your system will have time to process the water. Do not place concrete or asphalt on top of the field. Grass is the best coverage to prevent erosion and helps remove excess water. Do not plant shrubbery or trees in the field area. The roots will make their way into the lines and cause a blockage of the line. Redirect any water from gutters, patios, driveway or any other area from away from the drainfield area.